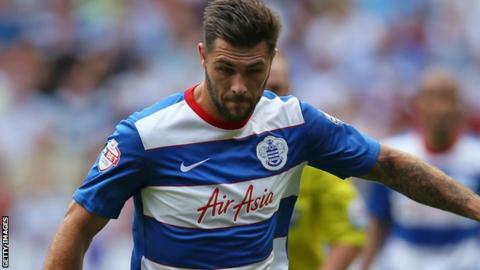 Striker Charlie Austin is likely to leave QPR if the club gets the right offer for him, says boss Chris Ramsey. The 26-year-old scored 18 goals in the Premier League last season, but could not help prevent QPR being relegated from the top flight. Austin started QPR's 2-0 Championship loss at Charlton despite being linked with a move away from the club. "If the owners get the right money, I think he will be moving on," Ramsey said after the loss at The Valley. "He would be a big loss for any club in any division. He's going to be a massive gain for anybody that has the money to buy him." Having begun his career at non-league Poole Town, Austin signed for Swindon Town in the summer of 2009. After 37 goals in 18 months at the County Ground he moved to Burnley where he scored 45 goals in one-and-a-half seasons. QPR paid £4m for him in the summer of 2013 and his 20 goals in his first season helped the West London side win the Championship play-offs. He rose to prominence last year after scoring 10 goals in a nine-game period between October and December and was called up to the England squad at the end of last season. "I'm available until I'm told otherwise," Austin told BBC Sport when asked if he was leaving QPR. "It's out of my hands, it's up to what the club wants to do."